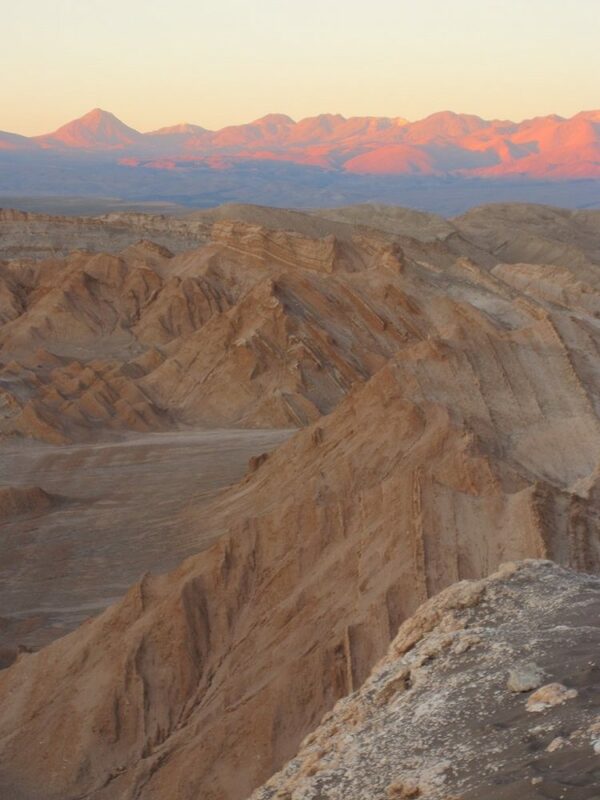 One step into the World’s driest desert will leave you beyond awe and rather wondering if you’ve left the Earth’s surface. 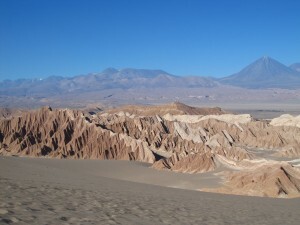 The cartoon-like Valley of the Moon, in Chile’s Atacama Desert, is sure to leave you wondering if you’ve stepped into a wild desert chase between Wiley Coyote and the ever elusive Road Runner. The valley is lined with sharp sandstone cliffs topped by vicariously hanging ledges of sheet like rock. The valley itself is wrinkled with jagged triangular pillars of which, to the creative eye, resemble the outer back spine of a dinosaur. 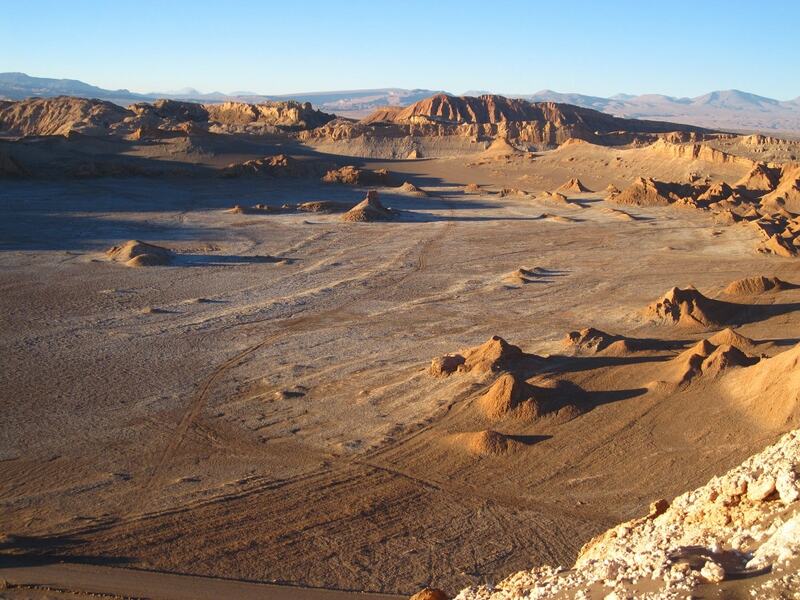 The Valley of the Moon is sure to draw the most cynical observer into a calm state of insignificance. sheer state of insignificance and wonder. 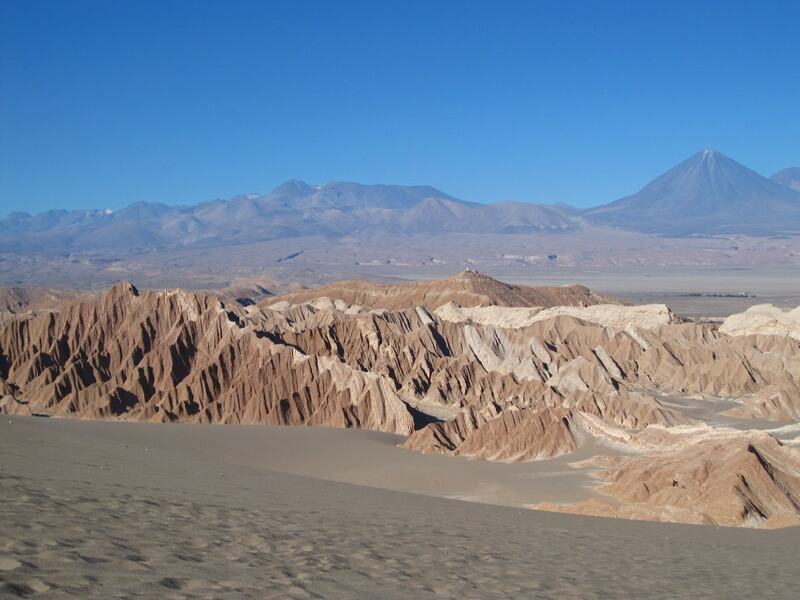 The Atacama is so quiet that visitor can feel embarrassed to make the most subtle of sounds. Its silent awe can have its intruders speaking in whispers as if to not to disturb its silent haven. The peaceful calm of this arid scene can even cause many to hold their breath, nervous about breaking its divine serenity. Guanacos, the rare South American members of the camelid family, also graze this vast dry land in search of small patches of green moss that determinedly grows on the rocks, or anything that it can find to fill the deep holes in their stomachs. And, yes, there are even real live Road Runners that scamper their way across the arid sand floor. The desert, in many ways, finds a way to breath despite its raw and bleak nature. never truly threaten, mirror the desert’s bright shades. For a place that can seem so monotonous during the day, in the evening time the desert glows a rainbow’s worth of colour. As the sun sets behind the high wall of sand that the locals have aptly named “The Big Dune” visitor to the valley expecting a sunset, and are instead treated to a light show. do not feel depressed by your insignificance, but in awe of the size and magnitude of our wondrous world. The biscotchas sound really cool. I’d love to see a photo of one. And roadrunners are cute too. I remember them from my desert days. Nice post and photos! Well written, Brendan! I always thought great desert scapes can only be found in Africa or Asia, but you’ve convinced me that the Americas have many a great desert landscapes. Thanks! Very inspirational! Thanks for the comments Jen!!! South/Central America is definitely the most diverse place on earth in my opinion. 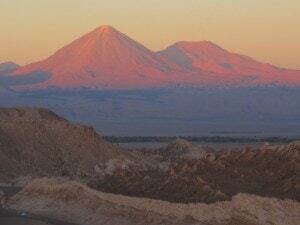 Peru itself has everything for Desert to Rain forest… can beat it! Fantastic photos! I wish I had that view right now. I need to go there! Gorgeous descriptions and photos! Amazing post! I need to get myself there pronto! Perhaps after I return from SE Asia..
Aracely and I loved this place. Incredible landscapes as you described. Great pictures! Did you visit the Geysers also? Beautiful photos and article about yet another awesome place that I hope to see one day. I appreciate your descriptions of visitors being in a “sheer state of insignificance and wonder” and being in “awe of the size and magnitude of our wondrous world”. You’ve perfectly put into words those feelings that I’ve had when in some desolate places and where the silence can be overwhelming. I actually didn’t know about Chile’s Atacama Desert before reading this article. Glad that I do now.